Crutches are a type of medical equipment that have one primary function: They help you walk. For certain types of injuries, crutches may be used instead of a wheelchair, and the strength it takes to use the crutches ensure you stay physically active–even if you’re not completely mobile. If you’re having trouble walking or have sustained an injury, a medical professional can advise whether or not crutches are the right choice for you. When used correctly, crutches help you heal so that you can get back in the game, hit the pavement, take on the trails, or simply enjoy a leisurely stroll in the park. There are several types of injuries and conditions that may require you to use crutches. In each of these circumstances, crutches provide the physical support your body needs while it heals. If you’re having any of the issues listed below, you may need to use crutches. Consult with a medical professional for treatment options and recommended medical equipment. Crutches are also commonly used as you recover from leg injuries, including sprains, fractures, and broken bones, and from certain types of surgeries. Walking with crutches is likely going to take some practice. As your legs heal, using the crutches will likely become easier. You may even gain some upper body strength in the process. Below are a few tips to follow when using crutches to walk. Get your crutches adjusted to fit your height. Lean the top of the crutches on your hands – not your armpits. Rely on your stronger leg for support for turns and overall balance. Take on stairs with your strong leg first, and use the handrail! Always look straight ahead when using crutches – never down. To ensure you’re using the crutches properly, talk with a medical professional at FastMed Urgent Care. Not using the proper technique with your crutches can significantly slow the healing process. A medical professional can also let you know how much weight you may put down on your weak or injured leg. No matter if you believe you may need to use crutches to help an injury heal or if you’re looking for more information about how to use crutches the right way, FastMed can help. We’ll provide you with prompt service and personal attention for your injury. 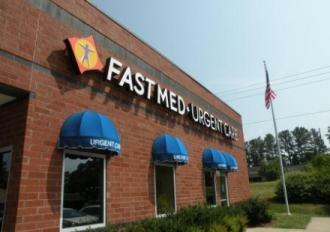 Get the care you need fast with FastMed. Join the conversation on Twitter to learn more about our clinics.